Mooney General Paper Co strives to keep its employees, customers, families and your families healthy, clean and as germ free as possible. Partnering with industry leading manufactures we can offer an array of solutions and products to meet this need. 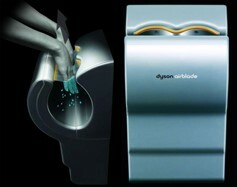 The Dyson Airblade™ hand dryer is the most hygienic hand dryer. It works in just 12 seconds – scraping water from hands like a windshield wiper. It’s the fastest hand dryer, removing over 99.9% of bacteria from the air before it reaches hands. Unlike paper towels, there are no trashcans to touch. There’s no unhygienic waste to dispose of. And without reliance on restocking, you’ll always be able to dry your hands. The One Shot® System sets the standard for quality and reliability in counter-mounted soap dispensing. Luxurious formulas encourage healthy hand washing, and patented Smart Sensor™ technology detects hands, automatically delivering the perfect amount of soap — every time! Automatic, touch-free flushing and cleaning systems for toilets & urinals keeps fixtures flushed & presentable leaving washrooms looking and smelling clean.